Urging Congress again to pass a portion of his jobs bill, President Obama claimed Wednesday that God is on his side. 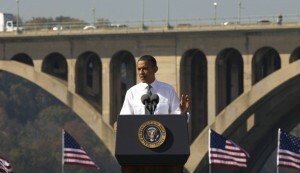 Mr. Obama was standing at the D.C. side of the Key Bridge, calling attention to America’s crumbling infrastructure and the need to put more construction workers back on the job. He criticized House Republicans for ignoring his legislation while approving a measure that reaffirms “In God We Trust” as the national motto.